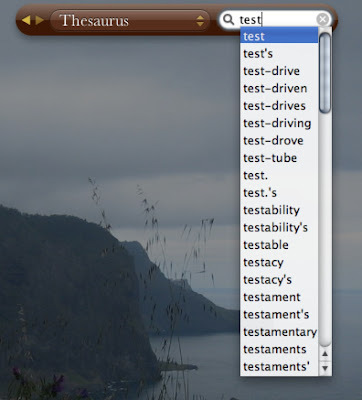 A New Mac Tip Every Day: Dictionary/Thesaurus Auto Completion! Great Tip, appreciate it. Btw, where can i share a tip with u? It did not work for me. Is there an option to turn on? Try clicking on the tip, and hitting Command R, to refresh the widget, might work? Didn't work for me either. I use this widget daily and never had the option of the drop down. I refreshed and still no change. Hitting F5 made it work for me! Maybe try going to the + sign on the bottom left, and adding it again? Thanx! I love tips like this. This generally works with most auto-complete fields in Cocoa applications. Well sure it works if you follow the instructions. Thank you. yeah pressing f5 works (i'm using tiger). also works like exactly the same on all cocoa apps. Great tip! keep it up. something similar happens when you hit esc while changing the name of a calendar on ical. Im not sure what the function of it is though. Can someone provide the exact link for this widget. The program is included in the with your Mac. To add it, just open the widgets, and on the bottom left there is an + sign. Click on it, and scroll through it untill you find one called Dictionary. You can either click on it, or just simply drag into where the rest of the widgets are, either way. You can now use the dictionary. To remove the widget, just click the + sign again, and an X will appear by each widget. Just click on the X sign and the widget will vanish. A short cut to delete the widget is just to hold the option key over the widget and the same X will appear. if you use the dictionary app (I keep it in the dock) it's faster to access and load, and it auto-completes after every keystroke.